A great pair of jeans is a staple piece for every wardrobe. In fact, they’re basically everyone’s go-to. So check out these pro tips for finding a great pair as well as some awesome fashion and care ideas! If you are looking for a good quality pair of jeans that will last, look for a heavier fabric. Higher quality jeans are made from sturdier, heavy-weight denim. While they might not feel as comfortable when you first try them on, once you break them in, they will soften and feel comfortable. If you like jeans with a bit of stretch, check the label for the percentage of spandex or lycra. Pro tip: go for no more than 2%. Any more than this and after a few wears your likely to see them begin to sag – which is very unflattering. Also, if you are in between two sizes, its usually best to go for the smaller size because they will likely loosen a bit after a few wears. Find the right size and shape pocket for you. Check out how the pockets sit when you have the jeans on. Pockets that are high and tilt outward give your derrière that fit and lifted look. Pockets that fall lower than the bottom curve of your bottom are not so flattering. Also, jeans without pockets really should just be avoided. 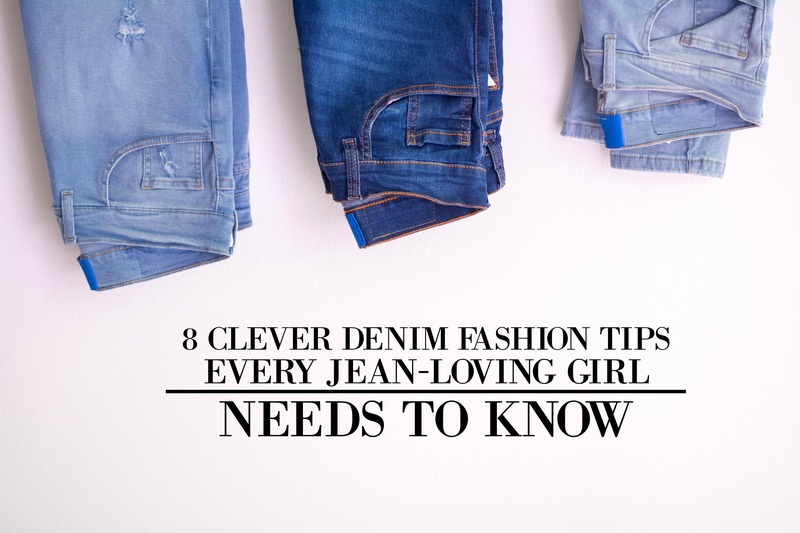 You should only wash your jeans if they’ve gotten stained or are starting to sag. The fewer washes the longer they will last. So to give them a freshening up between washes, hang them in the bathroom when you shower; the steam will give them a bit of a refresh. Or zip them up in a freezer bag and pop them in the freezer for two days. Yes, this actually works to de-odorize and kill bacteria! When you do actually go to wash your denim, turn them inside out and wash in only cold water to prevent fading. Also only wash denim only with denim. For your dark jeans, before the rinse cycle, turn them right side out and add ½ cup distilled white vinegar to minimize any fading. Also, air drying is preferred, but if you do use a dryer, turn it to the lowest possible heat setting and remove the jeans while they are still slightly damp. Lay them flat or hang them upside down to finish drying. Bummed your jeans are just a bit too tight? After washing, hang them from their belt loops and tug a bit at the waist band while they are still damp. For a bit more stretching, use a hair dryer to give it a few blasts while you tug at the waist band or try a hot steam filled iron. If you are looking to rock the denim on denim look, go for contrasting washes and colors and keep it simple. So for instance, try black jeans with a light blue denim button up. It’s a great look! Create a raw edge or cuff your jeans like a pro if you’re a shortie or just want to change up the length. For the raw edge, mark your jeans to your desired length and snip off the extra length, then loosen the threads a bit with tweezers and wash once for that frayed edge look. Folding your cuff depends on the type of jeans. For wide leg go for a two-inch cuff by folding it up twice. Skinny jeans look best with a half an inch fold. For slouchy boyfriend jeans, 4 inches is best while also scrunching up the bottom of the cuff then roll just the top hem down. We all love our jeans, they’re one of our favorite pieces. So try out these tips and tricks to keep them lasting longer and looking great!